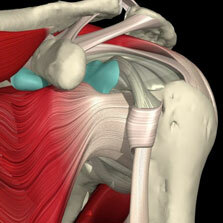 The Rotator Cuff is a group of muscles and tendons around the shoulder. These muscles are very important for the shoulder to function normally. It is very common for these tendons to tear as people get older. When the rotator cuff tears, it usually causes pain and weakness in the shoulder. Even though the rotator cuff tendon never heals, there is greater than a 90% chance that a patient will have no pain and a return of most strength to their shoulder after 3 months. There are a number of techniques to cope with the pain and weakness of a rotator cuff tear. Firstly, activities should be modified to decrease the demands and stress on the effected shoulder during the painful phase. Secondly, pain medication should be used when needed. Physiotherapy is of benefit in helping to prevent stiffness, and to regain motion and strength. Finally, shoulder injections (subacromial corticosteroid injections) sometimes also help to alleviate pain in rotator cuff tears, but last a variable amount of time. All these techniques should be used in a patient with a rotator cuff tear. In general (except for some specific circumstances- see below), surgery is considered a last resort for pain secondary to a rotator cuff tear. Only when most of the methods listed above have been tried for at least 3 months should surgery be considered. Surgery involves restoring the anatomy, by attaching the torn tendon back to where it was originally attached. Traditionally, this was done via a large “open” incision, however recent technological advances and techniques have allowed the evolution of arthroscopic rotator cuff repairs. These are technically demanding surgical techniques which aim to achieve equal results as traditional open surgery, while minimizing the surgical trauma to the patient by performing the surgery with an underwater camera on the end of a thin metal rod through 1cm incisions and not having to strip off muscles. This not only improves the cosmesis of the surgery, but potentially speeds up the return to normal activities. If surgery is performed to repair the rotator cuff, then in general a period of physiotherapy ranging from 3 to 6 months is required to assist in the recovery of motion and strength.